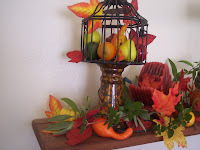 Seeing all the other bloggers out there getting their Fall decor together and showing beautiful pictures, I have just been itching to get started decorating! For me, it needed to be thrifty. So, I have been hitting the thift stores, clearance shelves and the dollar store. This afternoon I finally got a shelf done and my door wreath up. Yay me! I just love Autumn. It is my favorite time of the year. 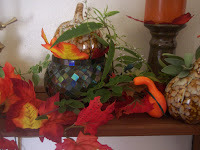 And I am so happy that I got a little bit of Autumn into my home. It makes me smile! The brass lamp is always on the shelf (bought at a thrift store ages ago). My most expensive item on this shelf is the little bird cage. It was $1.35 in a clearance area at Target (it was part of the outdoor summer clearance). Everything else came from the dollar store. Oh, I need to tuck that cord out of site! I decided that for a splash of fresh plants I would go out to my herb garden and cut sprigs of fresh herbs to tuck here and there. 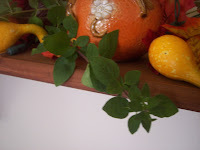 Fresh SageLet me tell you, there is no better candle/air freshener that can come close to using fresh herbs in your decorating! The smell is fantastic! 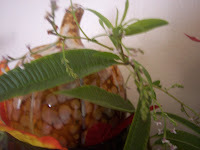 And if you want a little "hit" of fragrance, just rub a leaf or two, instant scent. And whats nice is, as the herbs dry, they still look pretty and natural. I added a small string of white lights that I had. 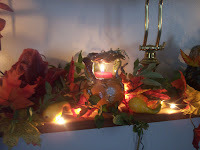 Here are picures of the candles lit and the lights on. After having the little lights on for awhile, they gently heated the herbs here and there and the smell is awesome! 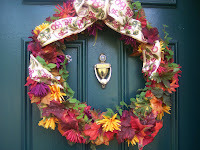 Here is the wreath I made for our door. I also tucked fresh Oregano in it. You have to check out these other blogs and the people who linked to them to see some great posts! 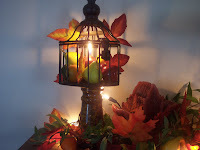 Visit with Julia and find out what "Treasures" are lurking in her post at Hooked on Houses for today's "Hooked on Fridays". Stop by Life as Mom for today's "Frugal Friday" post about how to reduce your expenses. And Amy is reminding us of one of our finest loves of life, our Grandparents! 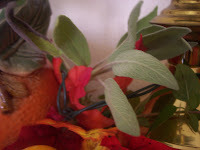 Check out her post at The Finer Things in Life for "Finer Things Friday". 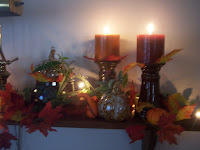 Join Melissa at The Inspired Room and check her "Labor of Love" . Stop by Expressly Corgi and see what projects are being done for today's "Get R Done" Friday! Hello! I found your blog via your husband's blog. Love that candlestick that the birdcage is sitting on. Reminds me of my antique Rockingham pottery. The sage is so pretty with the Autumn colors! Beautiful! 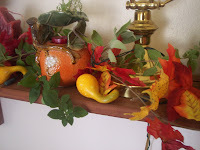 I just love fall decorating! Your pictures are beautiful. Fall is my favorite time of the year too. I just love all the changing of the colors and the weather. Awesome job and thanks for the wonderful fresh herb tip! 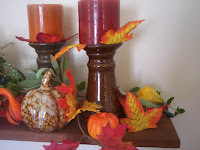 Great autumn decorating - such beautiful color choices! 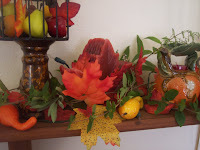 Autumn is my favorite of all seasons! Thanks for participating on Friday!